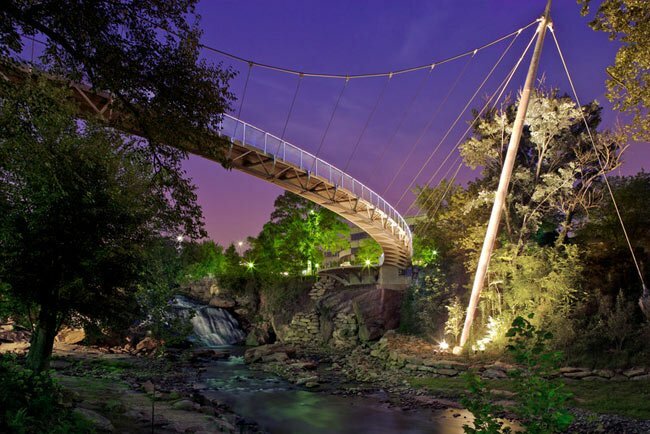 Falls Park in Greenville lets visitors spend a day along the Reedy River while also venturing into an active downtown. 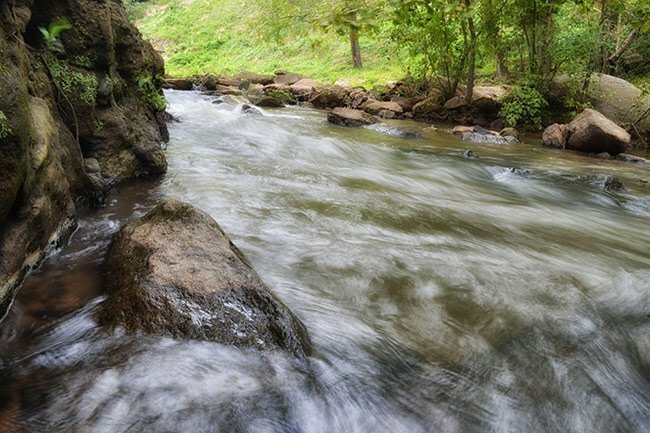 The river and its captivating falls were the perfect place for early settler Richard Pearis to build his grist mill in 1768. In time more mills formed along the river, followed by other industries such as an ironworks and a paper factory by the nineteenth century. Furman University purchased the land that comprises the park in 1852, and with the help of Furman, the City of Greenville, and the Planning Commission, the Carolina Foothills Garden Club was able to buy 26 acres for a park in 1967. Development of the land for public use began right away and continued for forty years, making the greenspace a true destination spot for both locals and visitors. Though the park was useable prior to the 1990s, in 1990 landscape architect Andrea Main was contracted to design an area that would allow people to better view and interact with the river and the space surrounding it. The vehicle bridge that passed over the falls was removed in 2003 and replaced the following year with a 355-foot-long suspension bridge – called Liberty Bridge – for pedestrians only, as seen above. 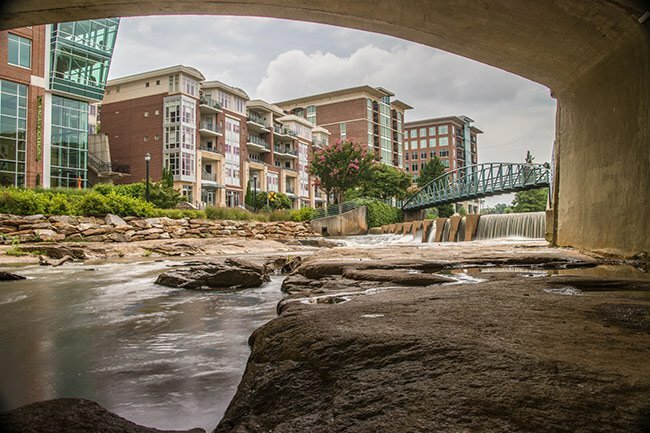 Though no mills or factories currently operate along the spectacular river, the rushing falls that run through the heart of Greenville continue to inspire people to settle here, if only for a Sunday afternoon. 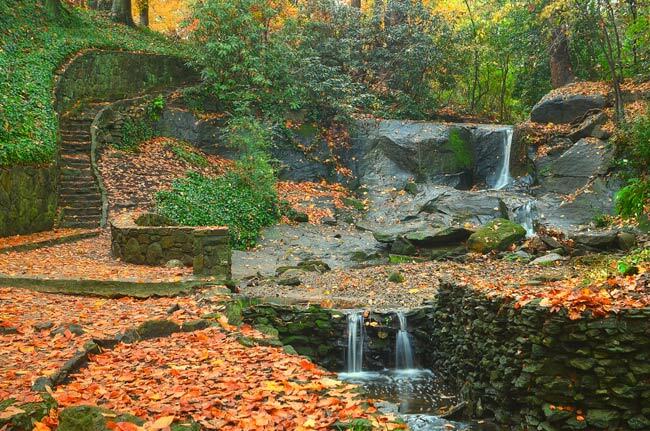 The newest section to open in Falls Park is the revived Furman University arboretum, now called Little Falls Park. The shady and secluded gardens and walkways behind the bustling main park offer contemplative strolls along stone paths as well as the beauty of scores of native plant species, all set to the background music of natural waterfalls. Furman University, which originally abutted this site, established its arboretum here in 1929. The arboretum was designed by Furman professor S.A. Ives. In 1932 the Greenville Garden Club added 266 trees to the arboretum with $500 in prize money awarded by Better Homes and Gardens magazine. A spring house within the arboretum allowed botany students to store plants, and its exquisite landscaping by the Greenville Garden Club made it a popular venue for locals. 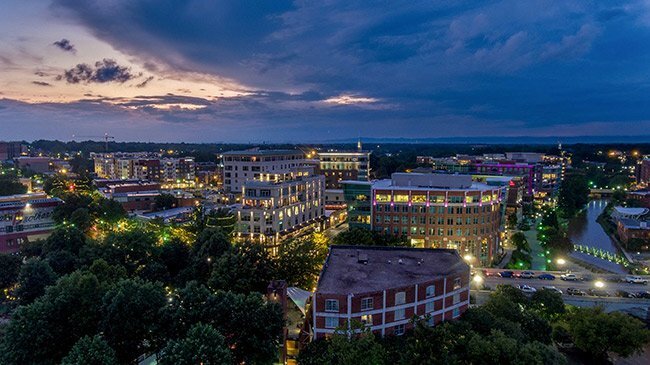 Previously the land had been owned by Vardry McBee, who helped make Greenville a commercial hub in the late eighteenth century. 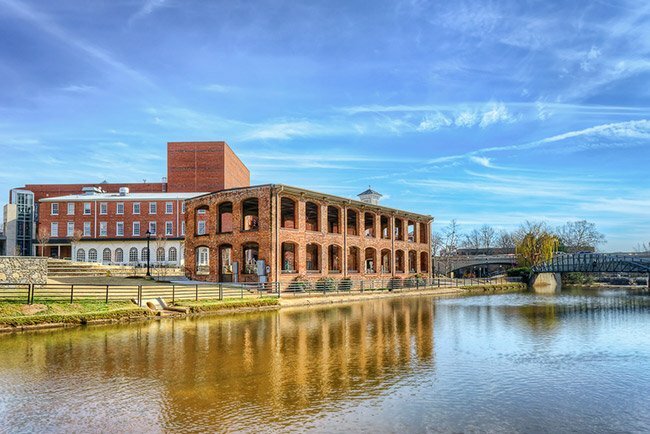 Two mills were built here – Vardry Mill and McBee Mill – and their ruins remain in the park. The terraces and paths found in Little Falls Park were built by the Works Progress Administration and continue to add to the park’s charm. However, when Furman moved to its current site in the early 1950s, the arboretum fell into disrepair. Furman eventually donated the arboretum land to the City of Greenville. 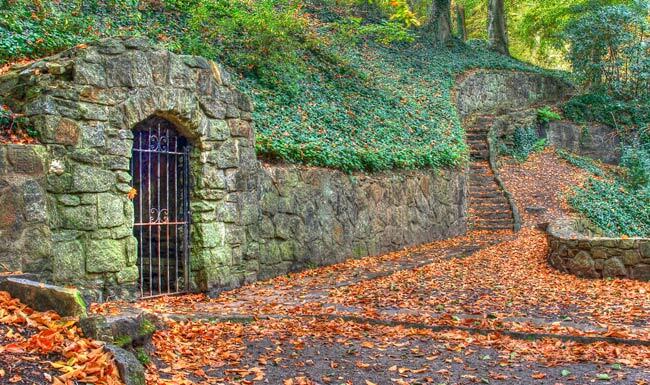 In 2012 landscape architect Julie Moir Messervy was hired to restore the overgrown property while maintaining its historical integrity, and today Little Falls Park is as popular and beautiful as its bigger sibling. 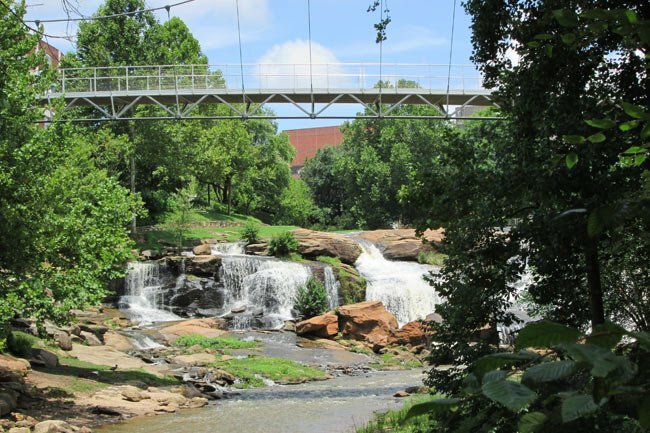 The Reedy River Falls are not only the geographical but also the historical center of Greenville. 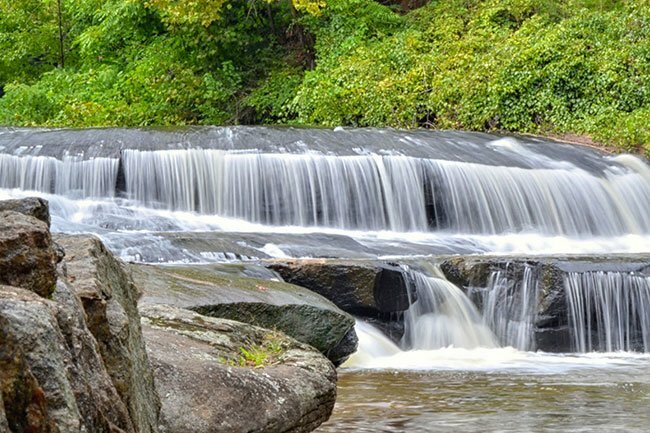 The speed and power of the Reedy River falls and rapids below them were indirectly responsible for the founding of Greenville at this site in the early 1800s. Since that time, the mills that were the economic life of the city sat near the falls and used their power to grind flour and cornmeal or manufacture textiles. 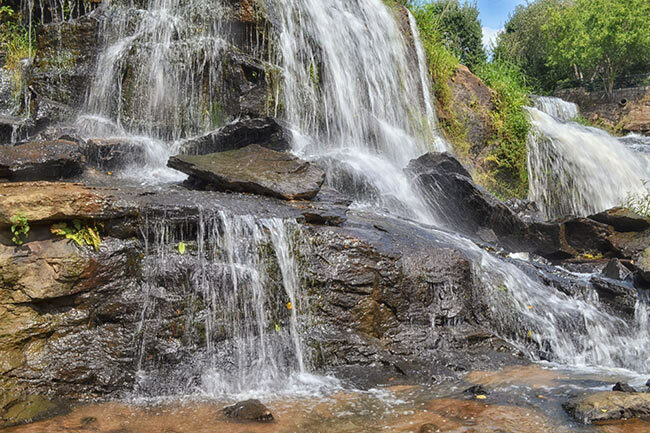 In the 1930s, the area surrounding the falls acquired additional significance as the site of a botanical garden and arboretum. Some brick ruins, presumed to be the remains of Vardry Mill built circa 1830, are still visible on the riverbank. 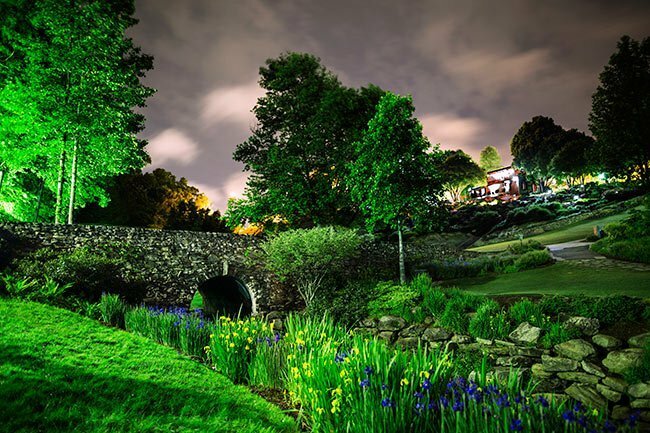 Rehabilitation of the area began with the opening of the Furman University botanical garden and arboretum in 1929-1930. So beautiful to see while you are there! !